If you are a fan of the clean look and feel of stock Android, you might want to take a leisurely Sunday afternoon drive to pick up the Nexus S 4G, just launched today by Sprint. With Android 2.3.4 installed, the Nexus S features the latest build of Google's open source OS. 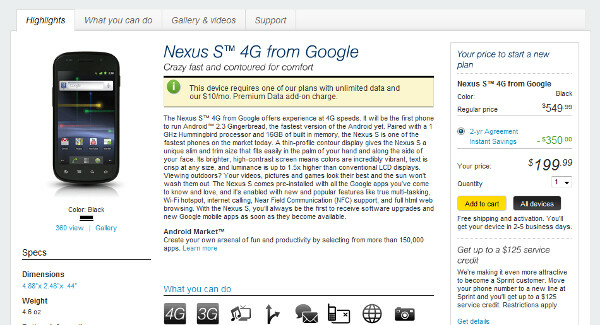 Manufactured by Samsung, the Nexus S is offered by the carrier for $199.99 with a signed 2-year contract. Off contract, the device will run $549. Of course, if you shop around, you might be able to find a bargain. Best Buy has a $149.99 contract price on the handset, for example. The Nexus S features a 4 inch Super AMOLED screen that is curved to provide optimal viewing angles for the user. Under the hood is a 1GHz Hummingbird processor and the phone has a 5MP camera on back and a VGA front-facing shooter. The model comes NFC enabled and features 512MB of RAM. For some, the main draw is what the Nexus S doesn't have. You won't find Touch Wiz here, which means that you get the clean Google experience that puts the handset first in line for the Ice Cream Sandwich update. The thing about these samsung phones is that they are charging more than the value they deserve. This device is so old now and they charge for it like it is new. Many of the phones out now have similar specs for less. Then again it is a niche device. Niche device is fair. Kinda hard to put "high end" device tech on a phone that will only appeal to Android purists. It seem like a good phone, but it is the experience you are paying for. Let's see where it is priced by mid-summer. I would recommend to anyone interested in it to wait until the EVO3D and maybe the Sprint version of the Atrix comes out, just to see if the price comes down. At least owners of this phone won't have to worry about painfully slow updates, $199 its reasonable for that reason, look at Verizon they're pricing every 4G handset over $200 And $300! That's insane.